ADDIS ABABA, Oct 16 2014 (IPS) - Ethiopia has experienced its fair share of environmental damage and degradation but nowadays it is increasingly setting an example on how to combat climate change while also achieving economic growth. “It is very well known by the international community that Ethiopia is one of the front-runners of international climate policy, if not the leading African country,” Fritz Jung, the representative of bilateral development cooperation at the Addis Ababa German Embassy, tells IPS. This Horn of Africa nation has learned more than most that one of the most critical challenges facing developing countries is achieving economic prosperity that is sustainable and counters climate change. Ethiopia has also recognised how its abundance of waterways offer huge hydro-electric generation potential. Today, massive public infrastructure works are attempting to harness this potential to lift the country out of poverty. Along with China and India, Ethiopia provided a case study for researchers conducting a year-long investigation into issues such as macroeconomic policy and impacts; innovation, energy, finance and cities; and agriculture, forests and land use. Ethiopia’s Climate-Resilient Green Economy (CRGE), a strategy launched in 2011 to achieve middle-income status by 2025 while developing a green economy, “is proof of Ethiopia’s visionary engagement for combining socio-economic development as well as environmental sustainability,” Jung says. Deutsche Gesellschaft für Internationale Zusammenarbeit (GIZ), a German government-backed international enterprise for sustainable development, partnered with Ethiopian government organisations to tackle environmental issues. One programme has been the Sustainable Land Management Programme (SLMP), launched in 2008. Northern Ethiopia suffered significant soil erosion and degradation — with farmers driven to cultivate the steepest slopes, suspending themselves by ropes — before attempts were made to counter ecological destruction. 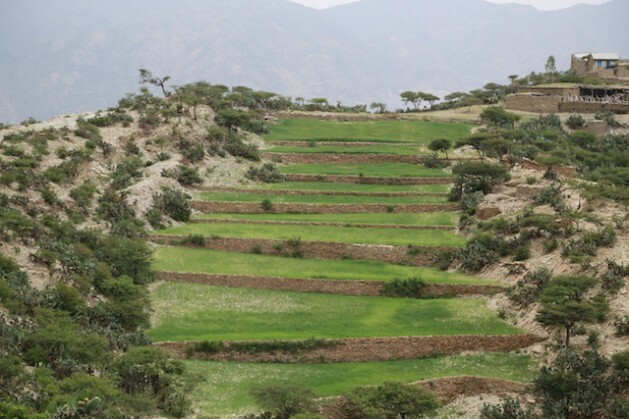 Since then approximately 250,000 hectares of degraded land in Ethiopia’s highland areas of Amhara, Oromia and Tigray — in which over 50 percent of Ethiopia’s 94 million people live — has been restored to productivity. This has been achieved through promoting sustainable land management practices such as the use of terracing, crop rotation systems, and improvement of pastureland and permanent green cover, benefiting more than 100,000 households. “SLMP with its holistic approach increases water availability for agriculture and agricultural productivity and thus contributes directly and indirectly to an increased climate resilience of the rural population,” Johannes Schoeneberger, head of GIZ’s involvement, tells IPS. One particular example of this, Schoeneberger says, was the introduction of improved cooking stoves combined with newly established wood lots at farmers’ homesteads reducing greenhouse gas emissions and pressure on natural forests. It also reduced households’ bills for fuel wood, he notes. When it comes to countries working out effective methods to enact, Ethiopia finds itself somewhat of an authority on achieving sustainability due to past experiences. The result of that research was a report called the New Climate Economy (NCE) released last month in Addis Ababa and New York. NCE is the flagship project of the Global Commission on the Economy and Climate, established in 2013 — Ethiopia was one of seven founding members, and the Ethiopian Development Research Institute participated in the global partnership of leading institutes informing the NCE — to examine whether lasting economic growth while also tackling the risks of climate change is achievable. And the NCE has concluded that both goals are possible. This turnaround has been made possible by structural and technological changes unfolding in the global economy, and by opportunities for greater economic efficiency, according to the NCE. By focusing on cities, land use and renewable and low-carbon energy sources, while increasing resource efficiency, investing in infrastructure and stimulating innovation, it is claimed a wider economy and better environment are achievable for countries at all levels of development. Although Ethiopia is by no means out of the woods yet. “Climate change together with other challenges like demographic growth and competing land use plans continue to threaten the great natural resource base and biodiversity of the country,” Jung says. But Ethiopia appears to have heeded past problems and chosen to follow a different, and more sustainable, path. And according to those behind the NCE there is reason for optimism globally on how to achieve a more sustainable future. They hope that the NCE’s findings will encourage future agreement and cooperation when nations discuss and implement international climate change policies, allowing the ghosts of the Kyoto Protocol and the Copenhagen Accord — previous efforts judged ineffective — to be laid to rest. But others, such as environmental economist Gunnar Köhlin, director of Sweden-based Environment for Development Initiative, point out that previous sustainability initiatives have struggled to achieve tangible results, especially in Africa. In light of this and the failure of previous projects, Köhlin suggests, the NCE begs the question: What will be different this time? The true test of the NCE’s merit will come at the next major convention on climate change due in Paris in 2015, when world leaders will wrestle with, and attempt to agree on, international strategy. “Let us hope Paris might bring about historic decisions and agreements, and this report might contribute to that end,” Moges says.